1999 : Creation of the company La Thermodynamique de Bretagne. 2003 : Export sales development. Partnership between LTB & York Marine International. 2007 : Extension of LTB. New bigger premises : 2400 m² Particular concern is brought to healthy working conditions New production plant : performance, quality and yield capacity. 2008 : LTB takes part in International exhibitions. 2009 : LTB celebrates it’s 10th anniversary. Inauguration of the new production plant, with the participation of the of Mr. Pascal MAILHOS the Finistère Prefect and the President of the Chamber of Commerce Mr. Jean-François GARREC. 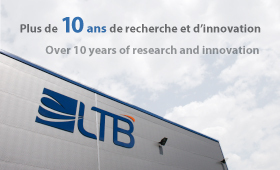 2010 : LTB becomes the French leader in water condensing split systems. Sales force development throughout the country. LTB exports worldwide, with over 40% of the company’s turnover achieved through export, mainly in Europe and Asia. In France, the specialized distribution network and prescribers insure LTB’s products’ marketing. Design : a research cell designs each unit (special or standard). Each member of our team has a large experience in airconditioning, thus enhancing our success : performance, liability, price, lead-time. Adaptation : standard products from our range are declined and modified on demand, in order to meet the user’s needs, the most current units are stocked. Reactivity : a true partner, LTB is capable of designing and manufacturing specific products in very short time. Qualité : fonctionnement en mode industriel, utilisation des composants standardisés sélectionnés avec rigueur, test de chaque machine avant livraison. Un système qualité type ISO a été mis en place.